Happy Holidays: Happy Saint Patrick's Day! I haven't had my Saint Patrick's Day collectables out for quite some time. Most of these items were bought several years ago. Several friends are always on the lookout for items and they have added a few items each year, you know who you are and thank-you very much. Here is the requisite long shot of the mantle just to give you an idea as to how it looks. Many of the items are small so I have added lots of close-ups for you to look at. The little pink plastic pig with a shamrock in his mouth is a windup toy. 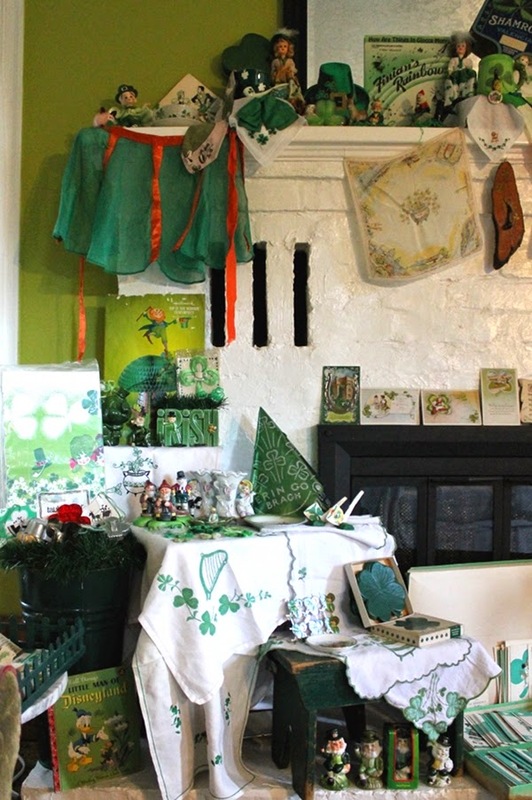 The Irish boy in front of a shamrock, the green top hat, and the leprechaun behind the shamrock are florist vases. A pack of Reed's St. Patrick's Day paper napkins stand behind the unmarked teacup and saucer. I love that tie, 1940s possibly, and do wear on March 17. A green silk covered candy box rests in the green top hat vase, in front is a plastic pipe resting on a green Japanese ceramic shoe. To the left of the little plastic Irish doll, one of three, is another chocolate box in the shape of an Irish top hat. Sheet music, "How Are Things in Glocca Morra" from Finian's Rainbow, stands behind a leprechaun sitting on a rock with a pot of gold at his feet. That leprechaun is rather creepy, I much prefer the other one to his right, your left. The donkey and the leprechaun were bought by my mum when my mum and dad went to Ireland in the 1960s. The tankard holds a cardboard fan advertising Shamrock Sunkist Valencias. I was given the Irish flag when I was in Ireland in 1969. Below the fan is a pack of paper plates and another tankard. The tankards were possibly used as vases. This close-up shows two small shillelaghs, a pin back button, a bottle of Guinness, and a brooch that I think may be papier mache. The 2 1/2 inch tall bottle of Guiness is a metal cigarette lighter. You hold the silver bottom and pull the bottle up and off to reveal the lighter. Two cardboard leprechauns stand behind two pixies sitting on a stump; they are over for a visit. The pixies are salt and pepper shakers and the stump is a mustard pot complete with a ceramic spoon, this set belonged to my mum. A small plastic pin is in front of another top hat vase. Tucked into the top of the vase is another St. Paddy's Day tie. A March angel holding a shamrock stands beside a black ceramic pig. In behind the pig is an unmarked ceramic plate with shamrocks around the rim. 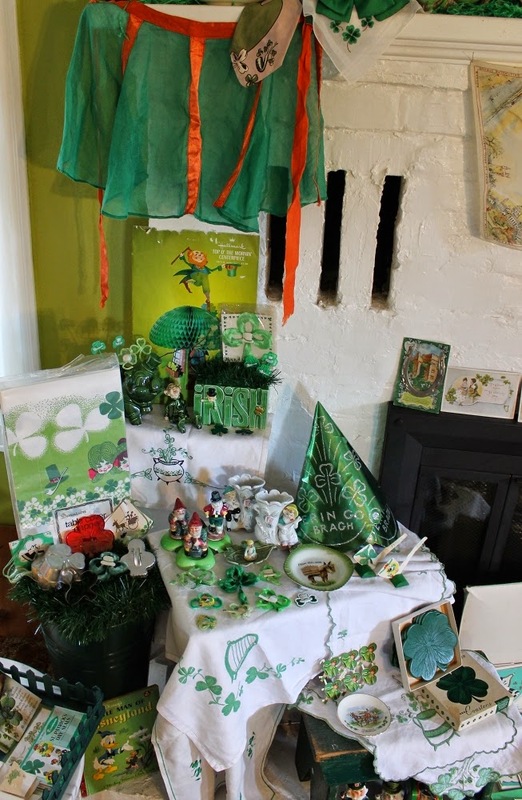 The Irish children are part of a set of items for the table, she is a condiment pot, the boy on front of her is a salt shaker, the boy with the basket is an ashtray, and the boy standing behind him is a toothpick holder. Here is a close-up the items on the fire place ledge; a green pig to hold your canapés at your Irish cocktail party, another florist vase, a Hallmark table centre piece, lapel pins, and cupcake picks. The three small shamrocks stuck in the back of the pig are chenille backed with cotton netting; one is plain, one has a cotton pipe in the centre, and the other has a cotton top hat in its centre. The large chenille shamrock has an embossed paper top hat in its centre; it is on its original backing in the original cellophane package. More small items, mostly lapel pins. I love the two place cards complete with their place card holders. The little fellow sitting in the oak leaves is actually a Cornish pixie, he stopped by for the festivities. A small souvenir dish from Ireland sits in front of six antique diecut scraps, to the right is a box of eight four leaf clover coasters. The green wooden tray holds cards and postcards, go to this link to see the antique cards and to this link to see the postcards. This series of three smoking leprechauns is interesting as it shows how one design is used over the years and adapted to different manufacturing processes; the first one is painted plaster, the second one is glazed porcelain, the third one is plastic in its original box. The last figure is similar but he is holding a basket of shamrocks in his left hand and a single shamrock in his right hand. He is hand painted ceramic. Why antiques dealers call paint cold glaze is beyond me, paint is paint folks. I picked up this counter top display box about twenty years ago, the box itself is water damaged but the cards are not, go to this link to see the cards that are in the counter top display box. The pig was my mums when she was a child. It is an antique ceramic chia pig, the modelling of the pig is superb. A set of paper plates stands behind these leprechauns from the late fifties or early sixties, some still have their oval stickers that say, "Made in Japan". The tall doctor leprechaun is a liquor bottle, the back of his head is a stopper with cork that when removed would dispense the medicine; was it Irish whiskey or a green liqueur? In behind him is a green flocked Leprechaun. Postcards, a wooden plaque and a gift book sit along the top of the fireplace doors, go to this link to see the plaque and other items, and to this link to see the gift book that I have scanned. I was given this postcard last Christmas, I was stunned when I saw it, the Horse shoe is stamped from thin silver coloured metal, is about 1/8 of an inch deep, and attached to the postcard with four metal brads. It came in a metal frame but I have taken it out to display it. I have an antique Christmas postcard with a small metal Santa and sleigh attached to it but I have never seen a metal decoration this size before, not that I have seen that many of this type of postcard. Here is one last link for you to check out; there are two images from books that I have scanned but more importantly a recipe for Irish soda bread that I got from a woman in Ireland when I was there. The bread is really good!